Meat alternatives have really come a long way. 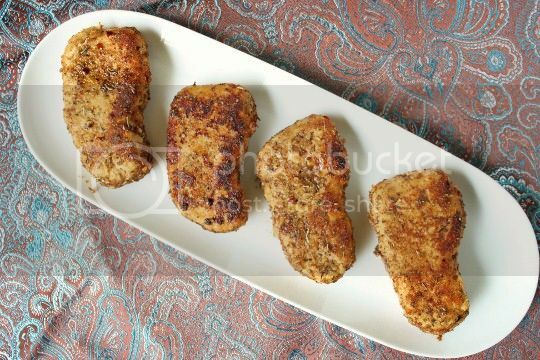 I wanted my first experience with Match Meats to be a good one, so I scoured the web for the most interesting sounding recipe for pork chops. Yes, I was determined to make a vegan pork chop. I found hundreds of recipes, but I settled on the one that seemed the most simple, and with pretty much all of the ingredients already in my pantry. Now, this didn't turn out to be exactly what I was expecting. Of course, I immediately imagined a sweet and chocolatey rub and was wondering how exactly that would play out in the end. Would it really be chocolatey? Would it be like eating dessert? How weird would it be? Would it even be successful? The rub itself is very easy to make. 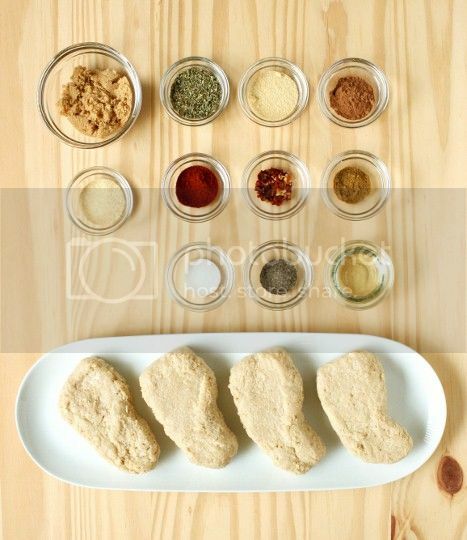 Simply combine a bunch of spices--the majority of which is brown sugar--and dredge the meat in it. The rub makes about double for what you'll actually need, but it's great on its own so be sure to save it for another recipe. The Match is very interesting. It's ultra sticky and thick, so use oiled hands to shape each chop. It smells like most fake meats, that sort of indescribable planty non-meat scent. I tasted some raw (don't worry, it's not real meat!) and thought it was pretty bland on its own. In fact, I might even suggest adding some salt to the meat and mixing it in thoroughly. If you can't find Match, seitan would work just as well. 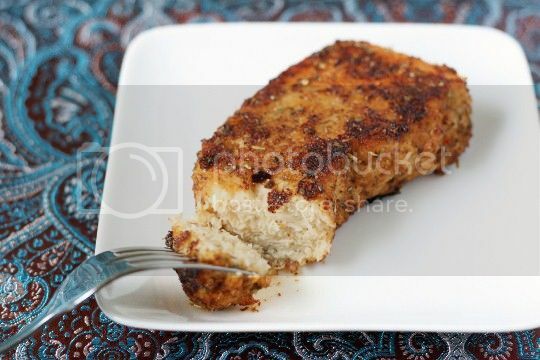 Although the photo shows a cast iron skillet to cook the chops, I'd suggest using nonstick. The rub is pretty dredged onto each chop, so some of it will stick to the pan if not well oiled. I was really surprised at how meaty and fibrous it was, like slicing into a real hunk of meat. Even more surprising is its juiciness factor, although the juices that run with each knife cut don't taste like much (again, I think Match itself needs to be seasoned before cooking, not just rubbed in spices or sauce). There wasn't much cocoa flavor, but rather an earthy, rich warmth in each bite. 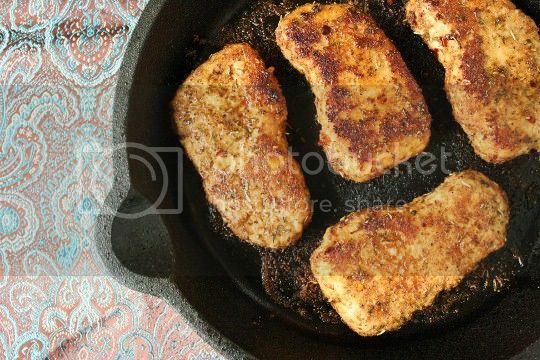 The brown sugar makes it slightly sweet and a bit caramelized, the cumin adds a smokiness, and the Italian seasoning creates an interesting woodsy note. These would be a hit for any winter holiday table, and best yet, the recipe is so versatile that you can adjust anything to your liking. Preheat oven to 350. Shape meat into 4 patties or chops. Set aside. In a small bowl, combine brown sugar, Italian seasoning, onion powder, cocoa powder, garlic powder, paprika, red pepper flakes, cumin, salt, and black pepper. Transfer spice mixture to a shallow bowl. Dredge each chop in the spice mixture until well coated. Add oil to a large nonstick skillet over medium-high heat. Add chops and cook for about 5 minutes per side, or until browned and crisp. Finish in the oven for 5-10 minutes, if desired. Nutritional data (per piece): Calories 232, Fat 9g, Sodium 608mg, Carbs 21g, Fiber 5g, Protein 20g. How convenient that I was planning to make seitan tonight anyway, and I have all the other ingredients...looks delicious! Hi...I see the directions say to preheat the oven, are we putting the chops in the oven after frying? vegan meat is a broad term. if you are talking about soy/tofu, neither is particularly healthy. any other suggestions for a "vegan meat"?? And actual meat or pork is far less healthy than any of it, so you'll be fine.